our dogs will always try, we just need to show them the way.. If we ask the question when training our dogs ‘How can I help my dog now ?’ it changes our whole perspective and approach to training. Everything from the very basics of heelwork and steadiness to the very limits of teaching lines and blinds becomes more of a team effort rather than a push-me pull-me battle of wills. Mr Jason Mayhew with new friend Fred..
1. We should look for the smallest try and work with it. 2. Ask ourselves what we can do to help our dogs ? 3. Investigate…does my dog know what I’ve asked …test it, and if it doesn’t then its okay to move back a step. Subsequently you will find it allows both you and your dog breathing space, time to think about what we are asking of them, their understanding of that ask and perhaps most importantly realising that it is okay for our dogs to make mistakes when learning. The ground was provided for the day by Mr David Barron. David has always been generous with providing ground for clubs to run working tests during the summer and also as a venue for people to meet and train on Friday mornings. 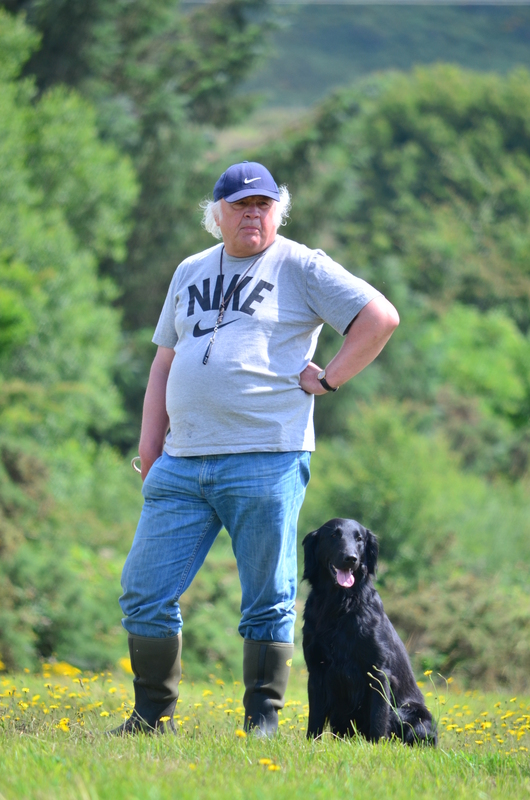 When I approached him and asked him earlier in the summer he set about building a professional level gundog training ground for the day…. In my wildest dreams I couldn’t have envisaged what he was able to create in such a short time frame. Remarkably he had managed to procure possibly the only flat field on the top of a mountain!! Bordered by deciduous wood there was everything needed in relation to gundog training…white flat grass to start young dogs off on, then falling down into rushy cover. The field is a wide rectangle, perfect for walk up. He had cut a winding channel through the middle and perpendicular to this runs a fence the whole width of the field, topped with timber and secured with sheep-wire. 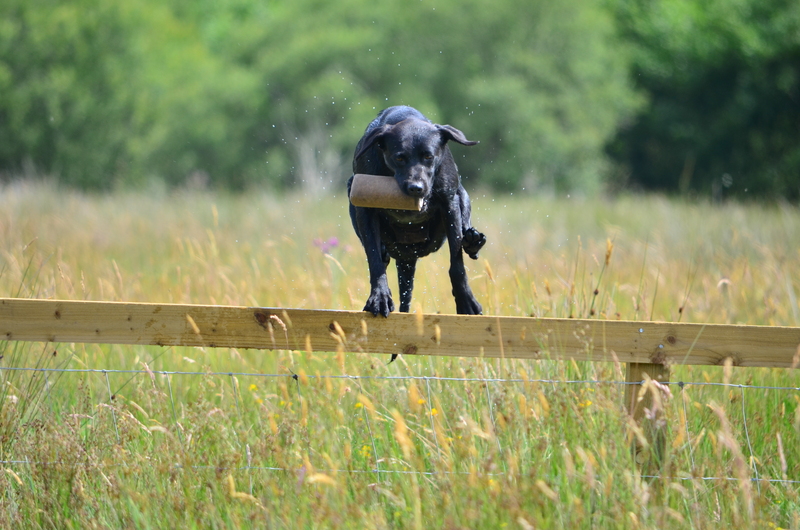 At intervals along the fence he has put slats of timber to enable the handler, when teaching a young dog to jump, to remove a level. He has left in the few willow trees scattered throughout the field which again are perfect for lining to a point and hunting an area of cover and all of this is set amongst the outstanding beauty of the Wicklow mountains. Finding a trainer with an interest in all breeds and every level of handler is important. I have known Jason for many years from when we started in Chesapeakes roughly around the same time. His main interest has always been in competitive working tests and field trials. He competed with his wonderful Chesapeake, Sage, to novice field trial level before taking the leap and buying a yellow Labrador, Georgie, to trial with…from here he has developed his training techniques and skill which is reflected in the success he is currently having with his young dog Flint on the working test circuit this summer. He has worked with most retriever breeds and spaniels. 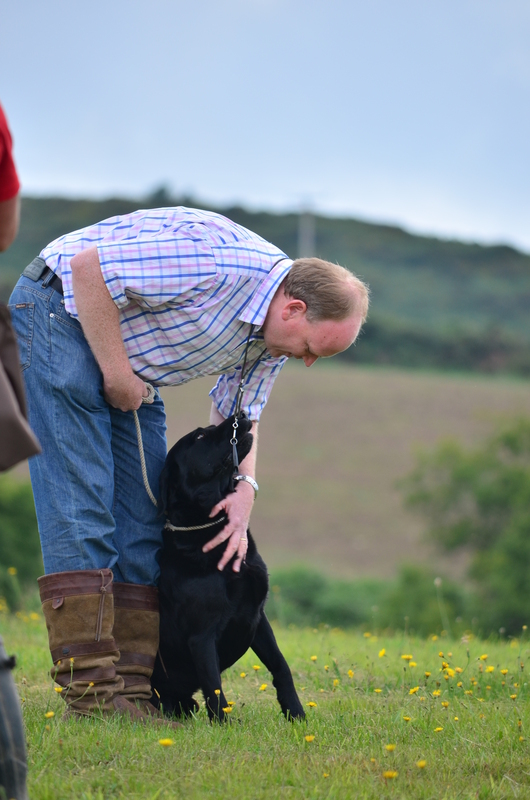 He has run breed specific training days for the UK Chesapeake club and also training days to prepare gundogs aimed at passing their show gundog working certificate as well as tutoring individuals ambitious to field trial. I had asked everyone attending if they had something they specifically wished Jason to focus on and problems ranged from lack of focus when in company with other dogs whether this was lunging or lack of interest in retrieving, dropping and shaking out of water, spinning when sent on a blind retrieve, running in, not listening to the whistle and from the handlers point of view they wished to know how they could improve their handling.. Helping a dog by improving handling. 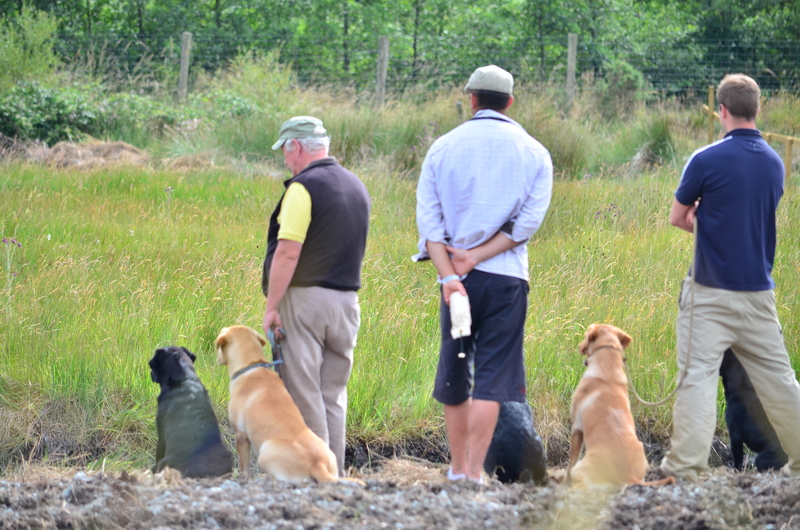 The morning was split into two novice groups where Jason was able to start at the very beginning of gundog work by reminding us that instilling strong foundations in close work such as heeling and lead control will pay dividends and is really vital in helping our dogs when progressing onto distance control. 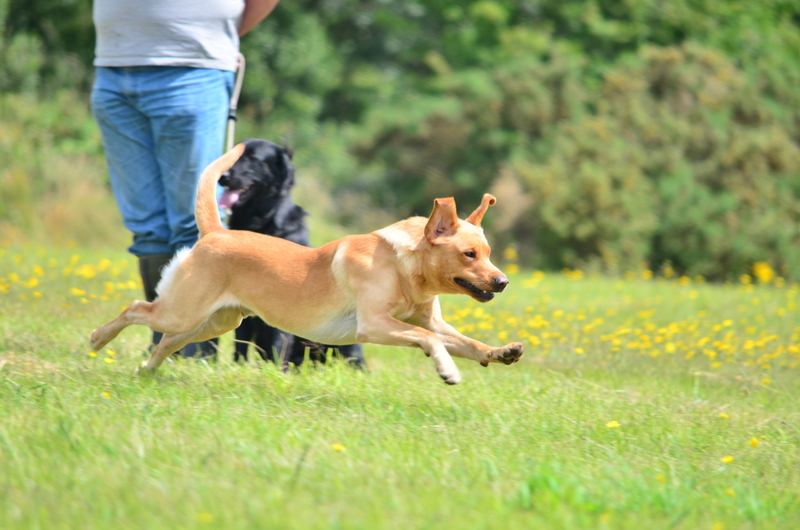 The second group that morning were slightly more advanced dogs, dogs that may be running prelim/novice working tests. It was in this group he met Monty, a beautiful young yellow lab whose owner was struggling with him running in. Jason asked him to remove his lead and kneel beside his dog putting his hands lightly around the dog’s chest, just enough pressure to hold the dog still. 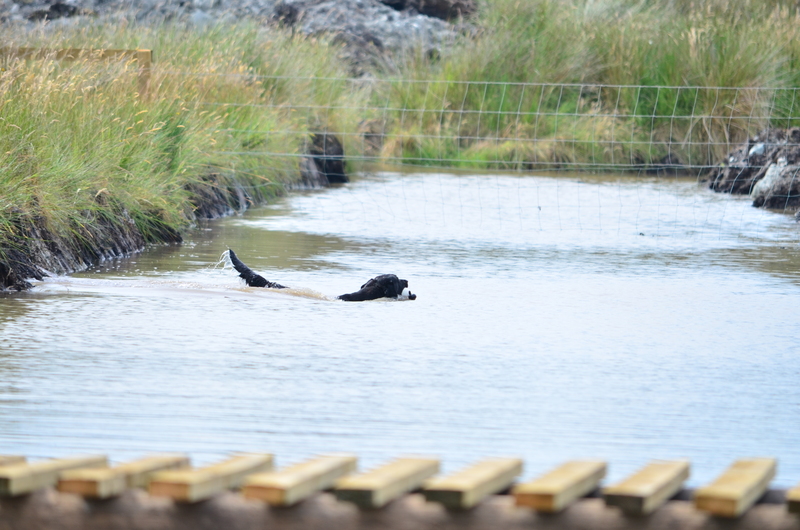 Then a retrieve was thrown and as expected Monty tried to push through his handler’s hands. Only when his dog relaxed, just for a fraction of a second, was he allowed to let him go. When he did run in Jason asked him to simply follow his dog quietly, slip his lead back on, walk back to where they both started and begin again. He again challenged us to ask the question, ‘do I need this fight now? ; when our dogs our learning should it be a battle? After three or four attempts Monty was sitting quietly with very little pressure and no lead as he watched other dogs work. The day brought together retriever breeds from all spheres. We learnt how to use wind to our advantage by locating the channel of scent when a retrieve is thrown, we focussed on strengthening our casting and reading our dog’s body language when sent on a run out. There was a lot to take in but I felt time was given to everyone. We broke for lunch and David invited everyone, if they wished, up to his house or rather as most of the guys now lovingly refer to as ‘the Man Cave’, with its vaulted ceiling straddled with heavy timber joists, stone fireplace and a huge billiard table taking center stage surrounded by old comfortable couches it oozes masculinity…but immediately feels homely and welcoming , inviting you to sit down, stretch out your weary legs, relax and talk. It was a chance for everyone to mingle, reflect on what had been taught that morning and speak to Jason in relation to any queries they may have had in relation to what he spoke about. Almost all the retriever breeds were represented. 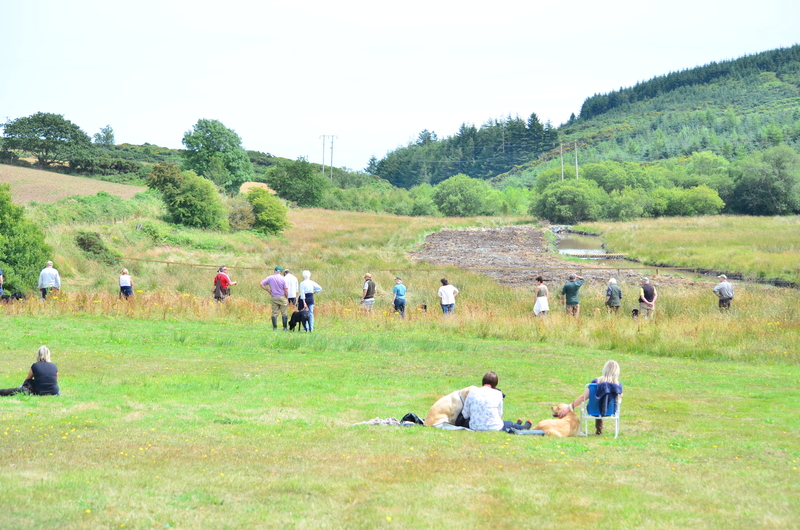 The afternoon was an opportunity for everyone present to have a chance to try out the magnificent piece of ground which David had developed. 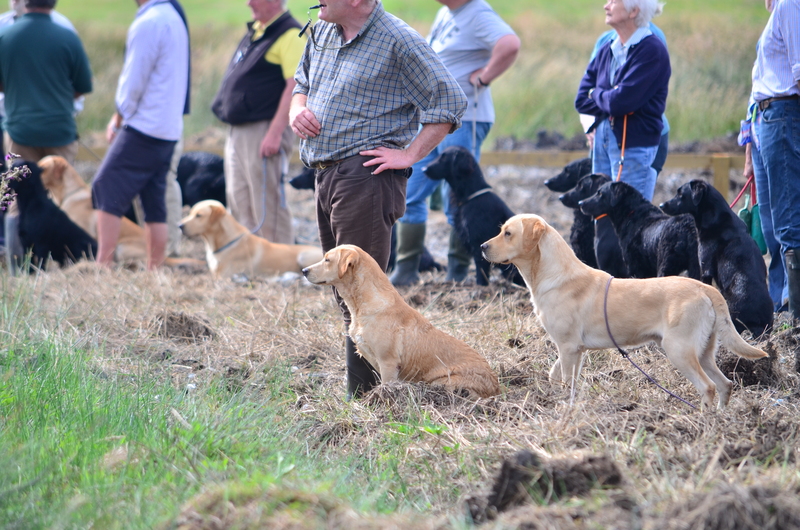 I was able to hang back, watch and take in the wonderful sight of so many beautiful retriever breeds gathered and eager to learn on this single piece of ground. Goldens, a Flatcoat, a Curly coat, a Chesapeake and of course the noble Labrador were all accounted for. 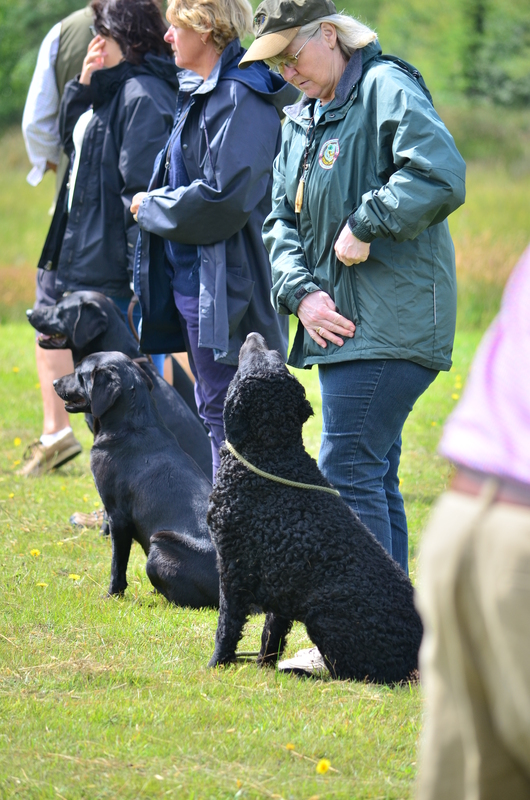 Each discipline was represented from the show dog, the picking up dog to the field trial contender and every level of handler from very novice to those from the trialling world. Making use of the jumping fence on the new ground. These people and their dogs made the day and without their presence it would not have been possible. 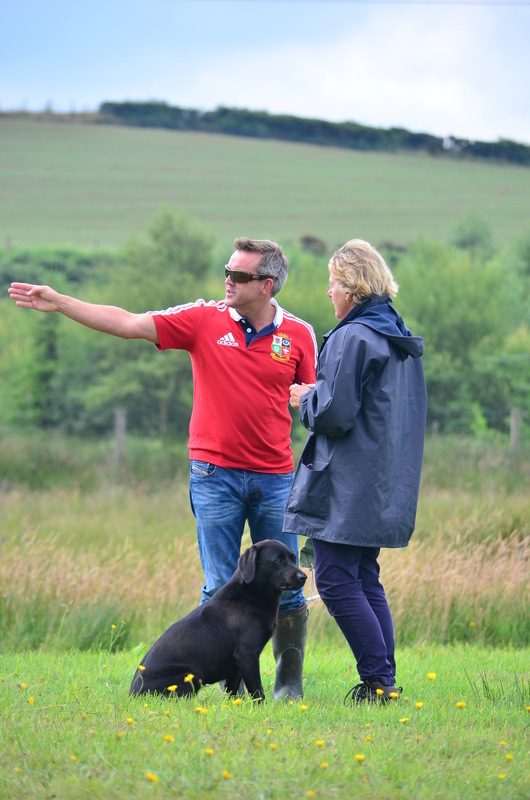 The numbers that attended showed a real need and desire among handlers in the working retriever world in Ireland to learn and progress. 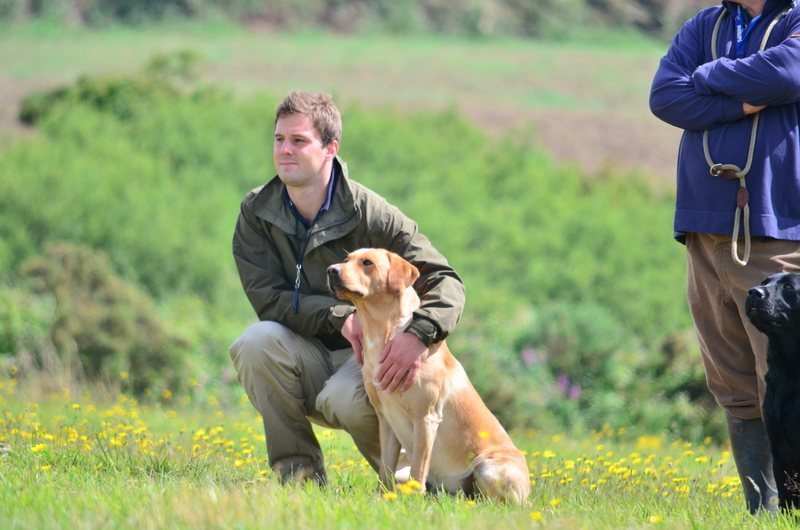 Gundog training is an evolving sport, constantly changing with new and better ways to get the best from both dogs and handlers. 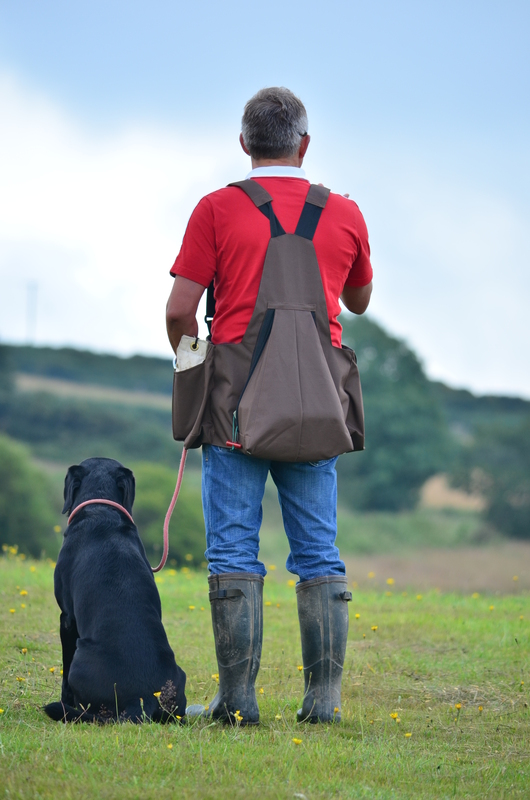 Although most gundogs will inevitably bring up the same problems in training, each individual breed needs to be handled in a different manner. This is where selecting a trainer becomes crucial. One who has a specific interest in dealing with all spectrums and levels of gundog and not just those aspiring to field trial. Perhaps just as importantly being able to engage and link in with the handler in communicating their message and in this therein lies the secret…. A huge thank you to my husband Des for acting as Jason’s assistant on the day as chief dummy thrower and launcher. This entry was tagged dogs, gundog training, nature, non-fiction, retriever training, retrievers, short post, writers, writing. Bookmark the permalink. Well done, Mary. If I got nothing else, I would have had a good day out in excellent company.The truth is got quite a bit from the day. It would be unfair to others who advised me over the years and more recently on my return to gundogs to say that Jason was a revelation. However, he had some excellent particular tips and I hope he’s finally taught me THE essential lesson: a working dog is anxious to please and the most common reason when he “acts up” is that he is confused. Then it’s time to back off, reassure and start again but with a slightly modified approach. At one stage my guy, Stevie, stuck his nose to the ground and, yes, he reckoned someone was in heat. I corrected him and the messing started. I was walking towards him and becoming cross when Jason said, “Don’t give him a command! Speak softly and slip on his lead.” It worked. Jason’s advice generally, “Avoid confrontation if possible. Another excellent piece of advice was to use training to train and not to keep it as close to a competition as possible. So if, for example, a dog’s attention is inclined to stray to other dogs when he’s coming back in, as soon as there’s a sign of it the advice is to walk forward and meet the retrieve, i.e. don’t let him get into trouble. Every trainer brings something different to the table so you end up with more to choose from when confronted with training problems going forward. I got quite a bit more but I’d best not waffle on here. Jason was excellent and – importantly – entertaining. You are right to emphasise David Barron. I train with him on Fridays during the summer. He’s always been extraordinarily generous with his time, his land and his help. He’s a hard man to thank adequately as he dismisses formality by saying that he’s enjoying himself – and he is! However, his latest project exceeds any definition of hospitality. 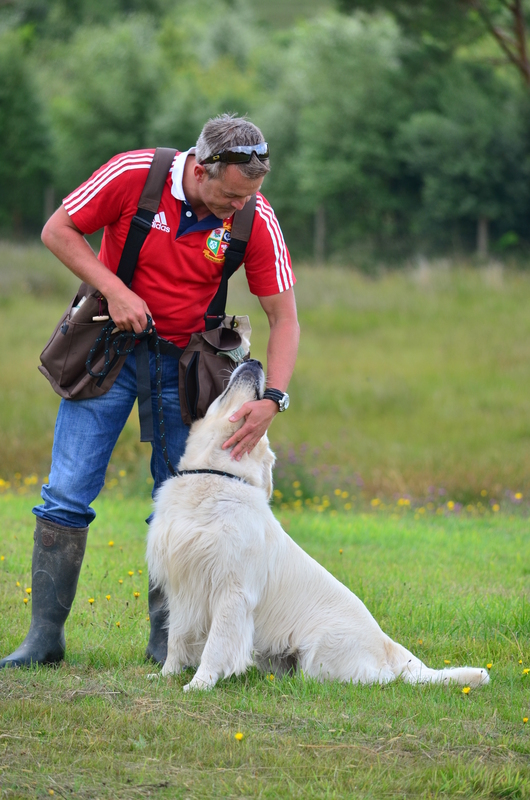 You’ve described it above; he’s created a huge, purpose built retriever training course! I’ll try to thank him again this Friday but he won’t be having any of it. Nevertheless, THANKS, DAVE!